Rookie LAPD Officer James Clark Beyea, 24, was on street patrol for less than three months when he was fatally shot by a burglary suspect. Beyea was born in Reseda, in the San Fernando Valley, and was named after his maternal grandfather, James Clark, an LAPD traffic officer who retired in 1961 and died in 1962, the year before Beyea was born. Beyea graduated from Grover Cleveland High School in Reseda in 1981, served in the U.S. Air Force, and was a member of the Air National Guard when he entered the LAPD Police Academy in October 1987. He graduated on March 25, 1988, and was assigned to the North Hollywood Division. 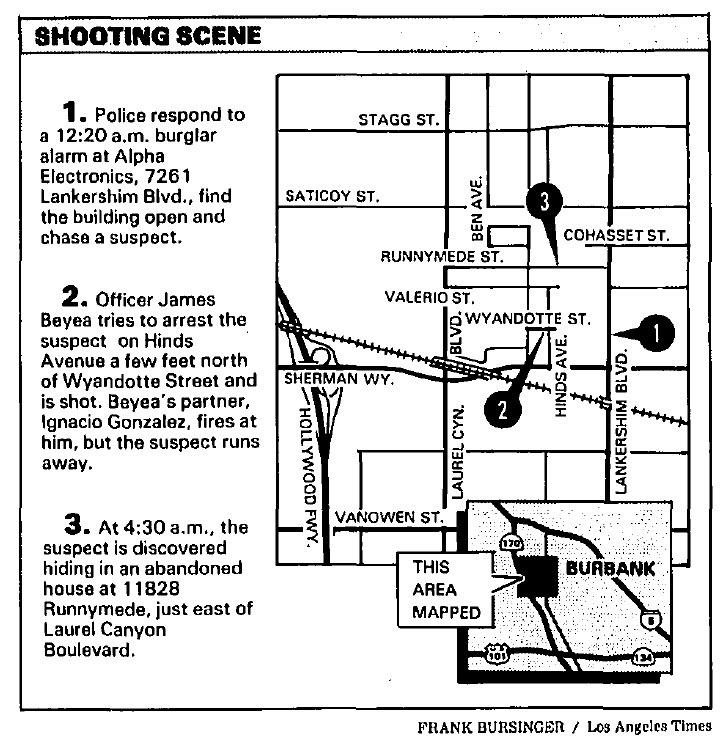 At about 12:20 a.m. on Tuesday, June 7, 1988, Beyea and his partner, Officer Ignacio Gonzalez, responded to a burglar alarm call at Alpha Electronics, at 7261 Lankershim Blvd., just north of Sherman Way in North Hollywood. Gonzalez, 44, an 18-year police veteran, was Beyea's training officer. Beyea and Gonzalez entered the electronics store through an open door. They searched inside and didn't find anyone, so they went back outside to wait for the owner of the store to show up, to open a storage room that appeared to be locked from the inside. While they were waiting, Beyea and Gonzalez heard the store's burglar alarm go off again, and noticed someone in a white jacket running from the darkness at the back of the building. The officers jumped into their patrol car and raced around the block to cut him off. Beyea jumped out of the car and ran after the man, while Gonzalez followed in the patrol car. Near the intersection of Hinds Avenue and Wyandotte Street, about two blocks west of the electronics store, Beyea caught up to the suspect and attempted to arrest him. As Gonzalez approached in the patrol car, he saw them struggling. He heard two gunshots, and saw his partner fall. As Gonzalez approached, the man fired a shot at him, and Gonzalez returned fire. Both shots missed their targets. The man in the white jacket ran north on Hinds, then turned left onto Valerio Street. Gonzalez radioed for assistance, then went to the side of his fallen partner. Beyea had been shot twice, once in the groin and once in the head, and his service revolver was missing. Beyea was taken to St. Joseph Medical Center in Burbank, where he was pronounced dead at 1:28 a.m.
About 50 officers, including seven canine units and a helicopter, swarmed the area to search for the suspect. About an hour after the shooting, officers found a 19-year-old man, about a block away from the electronics store, hiding in some oleander bushes. The man told police that he and a fellow gang member had broken into the electronics store to steal car stereos. When they heard police helicopters overhead, they dropped the stereos and ran in opposite directions. The 19-year-old said he saw Beyea chasing his accomplice, but he didn't see the struggle or the shooting. At about 4:30 a.m., few hours after the shooting, Beyea's killer was tracked by police dogs to an abandoned ranch house on a wooded lot at 11828 Runnymede St., about three blocks from the shooting. Officers used a ladder from the garage of the vacant house to climb up and check the attic, and found the suspect, crouched between the rafters. Police officers at the scene said the suspect initially complied with orders to surrender. He raised his hands and told the officers that the man they were looking for was hiding downstairs. He then attempted to grab for a nearby gun -- later determined to be Beyea’s service revolver. One of the officers in the attic fired a shot, hitting the suspect in the face. Two officers crawled over to the suspect, assumed that he was dead, and noticed the gun near him, but left it undisturbed for investigators. One officer remained in the attic while others searched the house. About three minutes later, the suspect stirred, and reached again for the gun. The officer in the attic warned him not to reach for the gun and, when he didn't comply, shot him again in the face. Two other officers in the house heard the shot, and climbed the ladder to the attic. They saw the suspect reach once again for the gun, and both fired. One missed, but one hit the suspect in the face, for the third time. After this shot, he didn't move again. Beyea's killer died less than two months before his 17th birthday. He and the 19-year-old who was arrested were both known to police as members of the Vineland Boys, a recently formed North Hollywood street gang. At the time of the shooting, Beyea's killer was on probation for offenses ranging from trespassing to auto theft. Beyea was survived by his parents and a sister. His funeral service at Praiswater Funeral Home in Van Nuys was attended by about 1,000 mourners, including family, friends, police officers from throughout Southern California, L.A. Mayor Tom Bradley, Police Chief Daryl Gates, representatives of the Air Force and Beyea's Air National Guard unit, and more than two dozen rookie LAPD officers who graduated from the Police Academy with Beyea less than three month earlier. 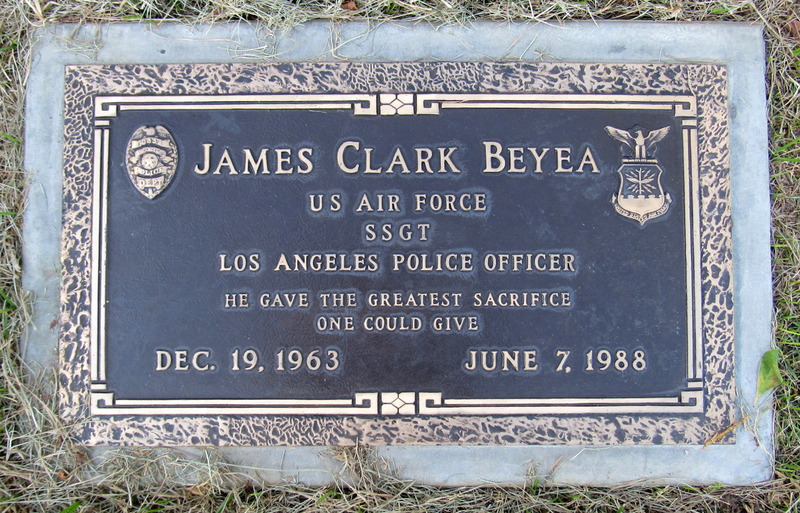 Beyea was buried at Oakwood Memorial Park in Chatsworth, under a marker that notes his Air Force and LAPD service, with the epitaph, "He gave the greatest sacrifice one could give." "I can only say he was considered by his supervisors and training officer to be one of our best," LAPD Capt. Charles "Rick" Dinse, commander of the North Hollywood Division, said of Beyea. "He was a sharp policeman who we expected to have a great career." The 19-year-old gang member who was arrested was charged with murder, under a California law known as the "felony-murder rule," which allows an accomplice to be charged with a murder committed during the commission of a serious crime. Following his trial and three days of deliberations, the jury found the teen guilty of both burglary and murder. He was sentenced to 25 years to life in prison on the murder charge, and two years on the burglary charge. He will be eligible for parole in 2017. In 1990, the parents of Beyea's killer filed a $2 million wrongful death lawsuit in federal court, alleging that the officers who shot him acted out of vengeance for the death of their fellow officer, and planted Beyea's gun at the scene. After a trial, the jury rejected their claims. In 2014, a one-eighth-mile section of a dirt path along Crebs Avenue in Reseda, adjacent to the Aliso Creek Flood Control Channel, was cleaned up, paved, landscaped, and formally named the James C. Beyea Memorial Walk. Beyea's sign is located on the northwest corner of Hinds Avenue and Wyandotte Street.